If you’re going to pay $167 for a Broadway ticket, you should probably learn about the ghost lurking in the theatre. Pointing to the gothic, duplex apartment above the Belasco Theatre on 44th Street, AMDA alumnus Tim Dolan explains to his tour group the odd idiosyncrasies of the Broadway theatre’s founder, David Belasco. “Even though he was raised Jewish, he liked the look of Catholic priests, so he dressed like a Catholic priest every single day of his life.” Tim notes that the apartment is considered one of the most haunted places in New York, where eye witnesses often report seeing a priest in the building on opening nights. Tim’s company, Broadway Up Close, specializes in offering patrons a unique perspective on the 40 theatres that make up Broadway. “Each tour is a journey through the history, ghost stories, anecdotes, legends and famous stories that happen in each place, why the buildings were built where they were, who built them, and interesting things that we don’t know about,” explains Tim. 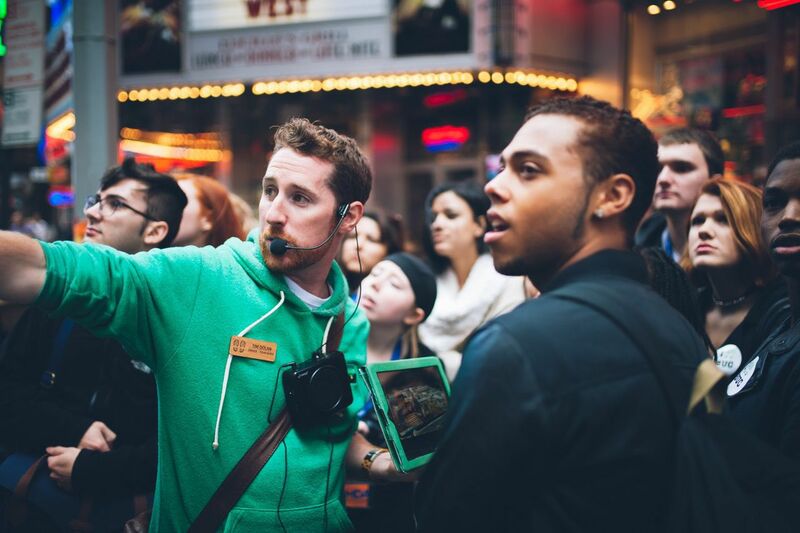 Recognized by their trademark green shirts, Tim’s team has become some of the most successful, acclaimed tour guides on Broadway. It’s been a long journey getting there. Tim’s acting career took off after AMDA, performing in the national tours of both Altar Boyz and Gentlemen Prefer Blondes as well as the Off-Broadway production of Altar Boyz. He appeared in the hit show "Boardwalk Empire", and has such regional credits to his name as Thoroughly Modern Millie, The Wizard of Oz, Singin' in the Rain and How to Succeed in Business Without Really Trying. Yet in time, Tim sought to deviate from the stereotype that actors have to focus on one profession to succeed in the industry. “I had always wanted to get my tour guide license, and I thought ‘there’s no tour that talks about what we do as an actor: how does a Broadway show work, what is that life like, what’s the history.’” After years of research, photo gathering and poring over every historical Broadway tome imaginable, Broadway Up Close came to life. Tim’s first tour—a test run with a friend—was a seven-hour marathon of all 40 Broadway theatres. Thankfully, he divided it into three more manageable tours as Acts I, II and III which explore the southern, middle and northern portions of Broadway, respectively. 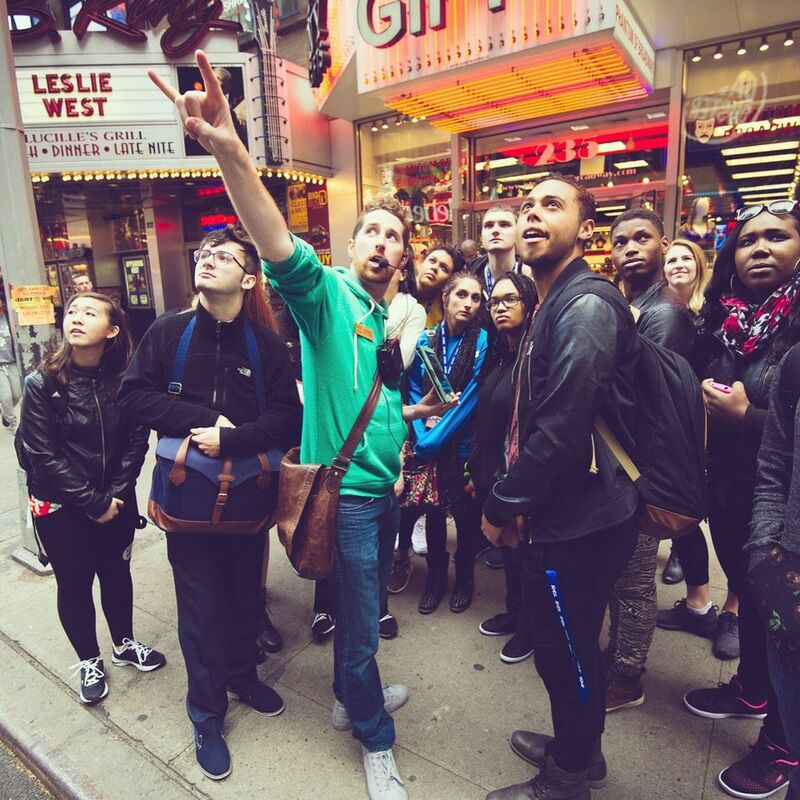 Six years of successful tours later, Broadway Up Close now has 15 tour guides (including AMDA alumni Michael LaMasa and Drew Pournelle), rave reviews from customers, and four consecutive annual Certificates of Excellence from TripAdvisor. For now, Tim remembers his roots, giving tours to increasing numbers of tourists, theatre patrons, and AMDA students, with the goal of someday giving tours to every single AMDA student who steps foot on the New York campus. Last month, in fact, Tim gave an AMDA orientation tour for the 326 incoming students that came to the New York campus. Visit Broadway Up Close and schedule a tour at broadwayupclose.com.